This chapter covers use cases for special-purpose MySQL storage engines. It does not cover the default InnoDB storage engine or the NDB storage engine which are covered in Chapter 14, The InnoDB Storage Engine, and Chapter 21, MySQL NDB Cluster 7.5 and NDB Cluster 7.6. For advanced users, this chapter also contains a description of the pluggable storage engine architecture (see Section 15.11, “Overview of MySQL Storage Engine Architecture”). For information about storage engine support offered in commercial MySQL Server binaries, see MySQL Enterprise Server 5.7, on the MySQL website. The storage engines available might depend on which edition of Enterprise Server you are using. For answers to commonly asked questions about MySQL storage engines, see Section A.2, “MySQL 5.7 FAQ: Storage Engines”. InnoDB: The default storage engine in MySQL 5.7. InnoDB is a transaction-safe (ACID compliant) storage engine for MySQL that has commit, rollback, and crash-recovery capabilities to protect user data. InnoDB row-level locking (without escalation to coarser granularity locks) and Oracle-style consistent nonlocking reads increase multi-user concurrency and performance. InnoDB stores user data in clustered indexes to reduce I/O for common queries based on primary keys. To maintain data integrity, InnoDB also supports FOREIGN KEY referential-integrity constraints. For more information about InnoDB, see Chapter 14, The InnoDB Storage Engine. 3. Implemented in the server via encryption functions. Data-at-rest tablespace encryption is available in MySQL 5.7 and later. 4. Support for foreign keys is available in MySQL Cluster NDB 7.3 and later. 5. InnoDB support for FULLTEXT indexes is available in MySQL 5.6 and later. 6. InnoDB support for geospatial indexing is available in MySQL 5.7 and later. 7. InnoDB utilizes hash indexes internally for its Adaptive Hash Index feature. 8. See the discussion later in this section. When you omit the ENGINE option, the default storage engine is used. The default engine is InnoDB in MySQL 5.7. You can specify the default engine by using the --default-storage-engine server startup option, or by setting the default-storage-engine option in the my.cnf configuration file. See Section 13.1.18, “CREATE TABLE Syntax”, and Section 13.1.8, “ALTER TABLE Syntax”. By default, a warning is generated whenever CREATE TABLE or ALTER TABLE cannot use the default storage engine. To prevent confusing, unintended behavior if the desired engine is unavailable, enable the NO_ENGINE_SUBSTITUTION SQL mode. If the desired engine is unavailable, this setting produces an error instead of a warning, and the table is not created or altered. See Section 5.1.8, “Server SQL Modes”. For new tables, MySQL always creates an .frm file to hold the table and column definitions. The table's index and data may be stored in one or more other files, depending on the storage engine. The server creates the .frm file above the storage engine level. Individual storage engines create any additional files required for the tables that they manage. If a table name contains special characters, the names for the table files contain encoded versions of those characters as described in Section 9.2.3, “Mapping of Identifiers to File Names”. The following options to mysqld can be used to change the behavior of MyISAM tables. For additional information, see Section 5.1.4, “Server Command Options”. The following system variables affect the behavior of MyISAM tables. For additional information, see Section 5.1.5, “Server System Variables”. While a compressed table is read only, and you cannot therefore update or add rows in the table, DDL (Data Definition Language) operations are still valid. For example, you may still use DROP to drop the table, and TRUNCATE TABLE to empty the table. You can check the health of a MyISAM table using the CHECK TABLE statement, and repair a corrupted MyISAM table with REPAIR TABLE. When mysqld is not running, you can also check or repair a table with the myisamchk command. See Section 13.7.2.2, “CHECK TABLE Syntax”, Section 13.7.2.5, “REPAIR TABLE Syntax”, and Section 4.6.3, “myisamchk — MyISAM Table-Maintenance Utility”. If your tables become corrupted frequently, you should try to determine why this is happening. The most important thing to know is whether the table became corrupted as a result of a server crash. You can verify this easily by looking for a recent restarted mysqld message in the error log. If there is such a message, it is likely that table corruption is a result of the server dying. Otherwise, corruption may have occurred during normal operation. This is a bug. You should try to create a reproducible test case that demonstrates the problem. See Section B.5.3.3, “What to Do If MySQL Keeps Crashing”, and Section 28.5, “Debugging and Porting MySQL”. In general, it is a bad idea to share a data directory among multiple servers. See Section 5.6, “Running Multiple MySQL Instances on One Machine”, for additional discussion. The MEMORY storage engine (formerly known as HEAP) creates special-purpose tables with contents that are stored in memory. Because the data is vulnerable to crashes, hardware issues, or power outages, only use these tables as temporary work areas or read-only caches for data pulled from other tables. Operations involving transient, non-critical data such as session management or caching. When the MySQL server halts or restarts, the data in MEMORY tables is lost. A read-only or read-mostly data access pattern (limited updates). Row-level locking and multiple-thread operation for low contention between clients. Scalability even with statement mixes that include writes. Optional disk-backed operation for data durability. Shared-nothing architecture and multiple-host operation with no single point of failure, enabling 99.999% availability. Automatic data distribution across nodes; application developers need not craft custom sharding or partitioning solutions. Support for variable-length data types (including BLOB and TEXT) not supported by MEMORY. MEMORY performance is constrained by contention resulting from single-thread execution and table lock overhead when processing updates. This limits scalability when load increases, particularly for statement mixes that include writes. Despite the in-memory processing for MEMORY tables, they are not necessarily faster than InnoDB tables on a busy server, for general-purpose queries, or under a read/write workload. In particular, the table locking involved with performing updates can slow down concurrent usage of MEMORY tables from multiple sessions. Depending on the kinds of queries performed on a MEMORY table, you might create indexes as either the default hash data structure (for looking up single values based on a unique key), or a general-purpose B-tree data structure (for all kinds of queries involving equality, inequality, or range operators such as less than or greater than). The following sections illustrate the syntax for creating both kinds of indexes. A common performance issue is using the default hash indexes in workloads where B-tree indexes are more efficient. The MEMORY storage engine associates each table with one disk file, which stores the table definition (not the data). The file name begins with the table name and has an extension of .frm. To create a MEMORY table, specify the clause ENGINE=MEMORY on the CREATE TABLE statement. As indicated by the engine name, MEMORY tables are stored in memory. They use hash indexes by default, which makes them very fast for single-value lookups, and very useful for creating temporary tables. However, when the server shuts down, all rows stored in MEMORY tables are lost. The tables themselves continue to exist because their definitions are stored in .frm files on disk, but they are empty when the server restarts. The maximum size of MEMORY tables is limited by the max_heap_table_size system variable, which has a default value of 16MB. To enforce different size limits for MEMORY tables, change the value of this variable. The value in effect for CREATE TABLE, or a subsequent ALTER TABLE or TRUNCATE TABLE, is the value used for the life of the table. A server restart also sets the maximum size of existing MEMORY tables to the global max_heap_table_size value. You can set the size for individual tables as described later in this section. For general characteristics of B-tree and hash indexes, see Section 8.3.1, “How MySQL Uses Indexes”. If a MEMORY table hash index has a high degree of key duplication (many index entries containing the same value), updates to the table that affect key values and all deletes are significantly slower. The degree of this slowdown is proportional to the degree of duplication (or, inversely proportional to the index cardinality). You can use a BTREE index to avoid this problem. If an internal temporary table becomes too large, the server automatically converts it to on-disk storage, as described in Section 8.4.4, “Internal Temporary Table Use in MySQL”. User-created MEMORY tables are never converted to disk tables. To populate a MEMORY table when the MySQL server starts, you can use the --init-file option. For example, you can put statements such as INSERT INTO ... SELECT or LOAD DATA INFILE into this file to load the table from a persistent data source. See Section 5.1.4, “Server Command Options”, and Section 13.2.6, “LOAD DATA INFILE Syntax”. A server's MEMORY tables become empty when it is shut down and restarted. If the server is a replication master, its slaves are not aware that these tables have become empty, so you see out-of-date content if you select data from the tables on the slaves. To synchronize master and slave MEMORY tables, when a MEMORY table is used on a master for the first time since it was started, a DELETE statement is written to the master's binary log, to empty the table on the slaves also. The slave still has outdated data in the table during the interval between the master's restart and its first use of the table. To avoid this interval when a direct query to the slave could return stale data, use the --init-file option to populate the MEMORY table on the master at startup. Memory is not reclaimed if you delete individual rows from a MEMORY table. Memory is reclaimed only when the entire table is deleted. Memory that was previously used for deleted rows is re-used for new rows within the same table. To free all the memory used by a MEMORY table when you no longer require its contents, execute DELETE or TRUNCATE TABLE to remove all rows, or remove the table altogether using DROP TABLE. To free up the memory used by deleted rows, use ALTER TABLE ENGINE=MEMORY to force a table rebuild. Both tables revert to the server's global max_heap_table_size value if the server restarts. The CSV storage engines supports the CHECK and REPAIR statements to verify and if possible repair a damaged CSV table. During repair, only the rows from the CSV file up to the first damaged row are copied to the new table. All other rows from the first damaged row to the end of the table are removed, even valid rows. To enable the BLACKHOLE storage engine if you build MySQL from source, invoke CMake with the -DWITH_BLACKHOLE_STORAGE_ENGINE option. You can check whether the BLACKHOLE storage engine is available with the SHOW ENGINES statement. Inserts into a BLACKHOLE table do not store any data, but if statement based binary logging is enabled, the SQL statements are logged and replicated to slave servers. This can be useful as a repeater or filter mechanism. The master writes to its binary log. 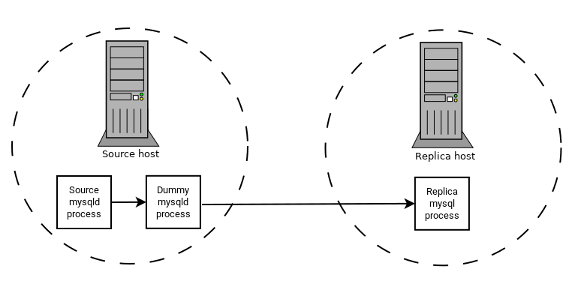 The “dummy” mysqld process acts as a slave, applying the desired combination of replicate-do-* and replicate-ignore-* rules, and writes a new, filtered binary log of its own. (See Section 16.1.6, “Replication and Binary Logging Options and Variables”.) This filtered log is provided to the slave. The BLACKHOLE engine is transaction-aware, in the sense that committed transactions are written to the binary log and rolled-back transactions are not. When using row-based replication, (binlog_format=ROW), a slave where the last columns are missing from a table is supported, as described in the section Section 16.4.1.10, “Replication with Differing Table Definitions on Master and Slave”. If the data is confidential, so the slave server should not have access to it. If the master has many slaves, filtering before sending to the slaves may reduce network traffic. Master column filtering can be achieved using the BLACKHOLE engine. This is carried out in a way similar to how master table filtering is achieved - by using the BLACKHOLE engine and the --replicate-do-table or --replicate-ignore-table option. A forum dedicated to the MERGE storage engine is available at http://forums.mysql.com/list.php?93. 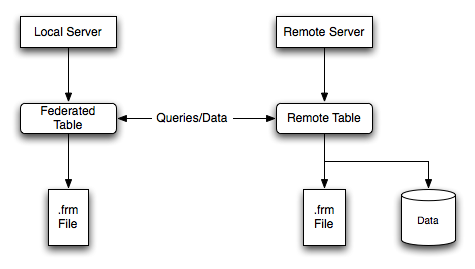 The basic structure of a FEDERATED table setup is shown in Figure 15.2, “FEDERATED Table Structure”. When you create the local table it must have an identical field definition to the remote table. You can improve the performance of a FEDERATED table by adding indexes to the table on the host. The optimization will occur because the query sent to the remote server will include the contents of the WHERE clause and will be sent to the remote server and subsequently executed locally. This reduces the network traffic that would otherwise request the entire table from the server for local processing.